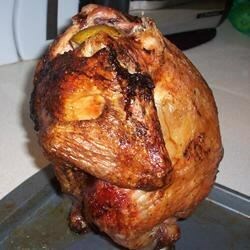 "Beer roasted chicken stuffed with limes brings a whole new dimension to chicken. It's both flavorful and juicy. This recipe is absolutely to die for!" Season the chicken inside and out with salt and pepper. Squeeze the juice from the lime over the whole chicken, then place the halves into the cavity of the chicken. Set the half full beer can in the center of a roasting pan or baking dish, and place the chicken over it in an upright position with the beer inserted into the cavity. Pour water into the bottom of the pan. Cover the chicken with aluminum foil, and place roasting pan and all into the oven. Roast the chicken for about 1 1/2 hours in the preheated oven, removing foil during the last 20 minutes. Baste occasionally with the drippings. When finished, the internal temperature of the chicken should be 180 degrees F (80 degrees C) when taken in the meatiest part of the thigh. Let the chicken rest for about 10 minutes before serving. This tangy summer chicken has so much flavor (and so little fat).